A Madagascan Sunset Moth Necklace from Debra’s Divine Designs will be included in a celebrity gift bag prepared by The Artisan Group® for GBK’s 2015 Pre-Primetime Emmys Gift Lounge. The Gift Lounge takes place September 18-19, 2015 at an exclusive location in Hollywood, CA. Madagascan Sunset Moth Necklace as gifted at GBK's 2015 Pre-Primetime Emmys Gift Lounge. The brilliant coloring of the Madagascan Sunset Moth has made it a popular choice for use in jewelry going back to the Victorian era. Debra Lynn Jeffries, owner of Debra’s Divine Designs (http://www.DebrasDivineDesigns.com), will gift her individually handcrafted bubble-domed Madagascan Sunset Moth Necklace to celebrities attending GBK’s 2015 Primetime Emmys Luxury Gift Lounge, in association with California-based The Artisan Group®. A specially designed women’s statement necklace and men’s bracelet will be showcased on display at The Artisan Group exhibit. The gifted necklaces feature wing fragments from the Madagascan Sunset Moth (Chrysiridia rhipheus), which Debra has artfully arranged and showcased under 18mm wide, dual-sided glass domes. The dome magnifies the intricate details of the wings and allows them to be visible from either side of the pendant. The pendants have a tiny copper Swallow bird charm. The pendant with charm hangs on an 18-inch copper chain. Celebrities will receive their pendant packaged in a black swirl box with a blue ribbon and an oval Debra’s Divine Designs label. Debra uses only ethically sourced wings in her jewelry collections. She notes that the butterflies and moths she uses fly in freedom on global butterfly farms until they naturally expire. There, workers collect them to be distributed to local dried specimen suppliers. The women’s statement necklace showcased on display is called The Gathering, and features three butterfly focals nestled together on a substantial, silver-plated chain. In nature, some of the butterflies used have a flashing that appears as various shades of violet and blue when in movement. The men’s bracelet is a simple oval domed owl butterfly, with lava and wood beads. The piece has a casual yet artistic vibe that is perfectly suited for fashion forward men who enjoy spending time outdoors and wish to celebrate the beauty of nature via their accessories and attire. Debra’s Blue Morpho Butterfly Wing Earrings have been worn by actress Nakia Burrise (as Patty Pritchett) on episode 401 of The CW Network’s Hart of Dixie. Her jewelry has also been included in exclusive The Artisan Group gift bags prepared for Earth Day 2014 and GBK’s celebrity gift lounges for the 2015 Golden Globes, the 2013 Primetime Emmys and 2014 and 2013 New York Fashion Week. Numerous blogs, including ImNotEvenKidding.com, Shoply.com and HouseEcoFriendly.com, have featured Debra’s jewelry designs. A Morpho Butterfly Wing Necklace was photographed on Ariel D. King, winner of the 2014 Queen of the Universe pageant. Members of the press who would like to learn more about Debra’s Divine Designs may contact Debra by email using the email button on the right. Also, visit Debra’s Divine Designs on Facebook, Instagram and Pinterest (@debrasdivinedesigns). The company’s Twitter handle is @DesigningDebra. *This event is not affiliated with The Primetime Emmys award show; Debra’s Divine Designs is not in any way affiliated with The Academy of Television Arts & Sciences. 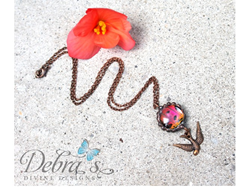 Madagascan Sunset Moth Necklace from Debra's Divine Designs.As gifted at GBK's 2015 Pre-Primetime Emmys Gift Lounge. 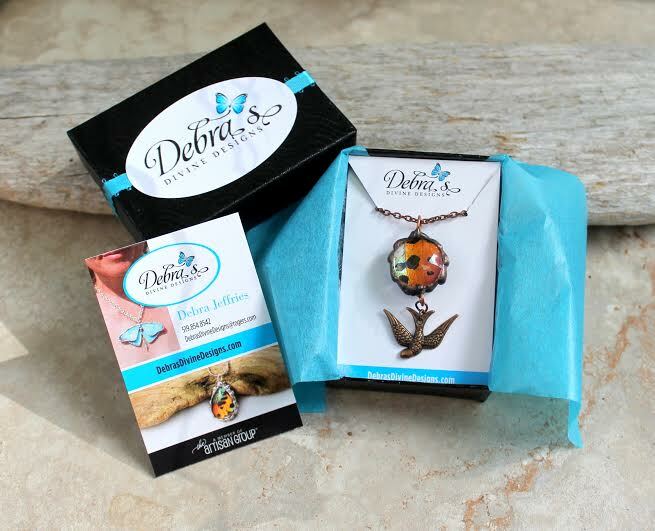 Madagascan Sunset Moth Necklace from Debra's Divine Designs, packaged for gifting atGBK's 2015 Pre-Primetime Emmys Gift Lounge. "The Gathering" Statement Necklace from Debra's Divine Designs.On display at GBK's 2015 Pre-Primetime Emmys Gift Lounge. Men's Owl Butterfly Bracelet with Lava and Wood Beads from Debra's Divine Designs.On display at GBK's 2015 Pre-Primetime Emmys Gift Lounge.